New trip offering for 2018! Our regular Half Day Lower Kern trip ends right above the Class IV section of the canyon. 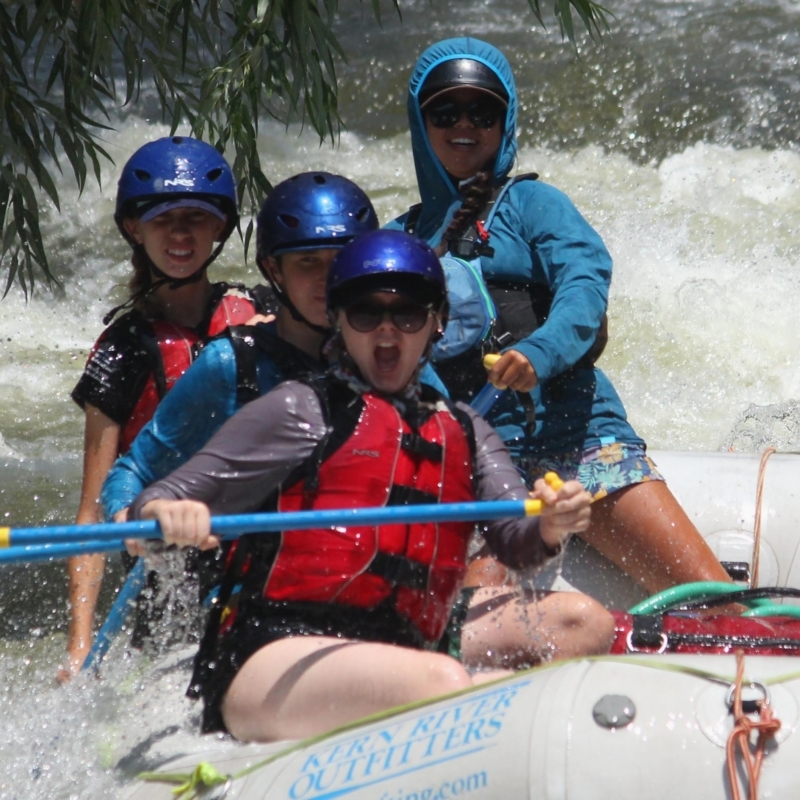 This new half-day trip begins right into the class IV section of the Lower Kern, including White Maidens, Sundown Falls and Powerful Possum rapid. We anticipate this action-packed trip to be extremely popular, so early reservations is highly recommended. Trip Packet: Click here to view the Half Day Class IV trip packet. Approximately 5 miles of rafting. Rapids are Class II, III & IV. Lunch is not included in this outing. This trip is great for beginners and experienced rafters. Arrive at our Rafting Center in Wofford Heights at 12:30PM. Check-in with our Rafting Center staff and meet the guides. They will assist you with any questions you may have. Once everyone from the trip has arrived and has checked-in, your Lead Guide will begin the orientation talk with what to expect for the afternoon, as well as hand out and fit helmets and lifejackets. Once suited up, you’ll load onto our shuttle bus and we’ll drive you to the put-in. At put-in, the guides will work on rigging the rafts while the Lead Guide will give the Safety Talk to the trip. Once finished, the Lead Guide will organize the different groups into rafts and you’ll meet your guide. To teach everyone how to paddle together as a team, your guide will give a Paddle Talk. Immediately following the Paddle Talk, the trip launches and is officially underway. The Half Day Lower Kern trip runs from the Sandy Flat put-in to our private Lower Kern campground. The start of the trip begins with mellow water to allow the guides to train everyone on paddling together. The first rapid is Hobo Rapid, which is a long Class-III. From here it’s Class-II up until our first big Class-IV rapid, White Maidens. This steep, technical rapid features challenging moves around rocks and through the goalpost drop. The next Class-IV is Sundown Falls, a short but steep drop. This leads directly into Silver Staircase rapid and then we finally end with the biggest Class-IV of the day, Powerful Possum. We can fit 4 – 6 (plus a guide) in each raft. This trip has a minimum age of 12 years old. Why is this trip only available in September? Being a new trip offering we want to soft open its availability which is why it’s only available in September and not August. 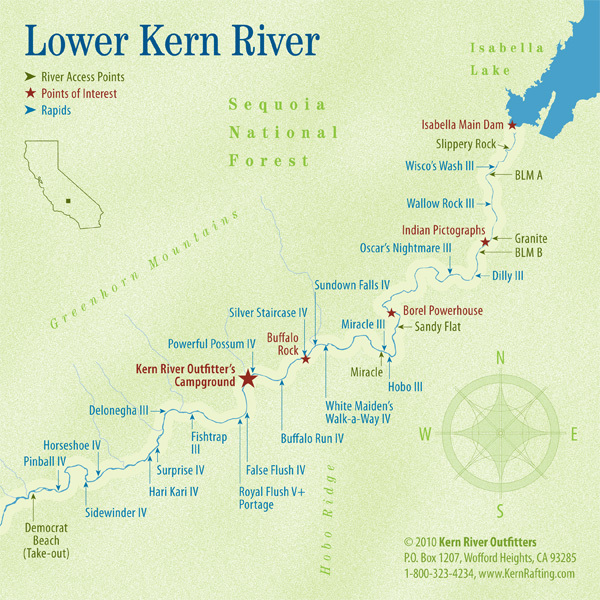 Which section of the Lower Kern is this trip? This is located on the Class-IV section of the Camp Run. My friends booked this trip. How do I join their party? Individual reservations made outside of a group reservation are linked together through the online waiver. When you complete the waiver, there is a field labeled “Group Organizer”. Simply write down the groups name, and we will know that you are a member of that party.